We wish to advise that Miss Siphiwe Ndlovu, who was serving as Junior Accounting Officer, is no longer part of the ELCZ Endowment Fund Trust. She has left the employ of the ELCZ Endowment Fund Trust. For any matters relating to the ELCZ Endowment Fund Trust, kindly contact Mr M M Dube, the ELCZ General Secretary on (0292) 254991- 2 or 0712361180 (Whatsapp). As already informed to all stakeholders, the ELCZ Bookshop that used to operate from office 220, Lutheran House, Bulawayo, moved to the ELCZ Central Church Head Office, Suburbs, Bulawayo from 1 January 2019. 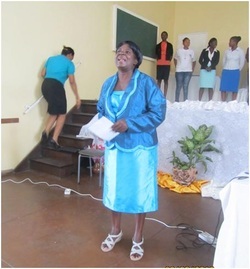 Ms Agnes Pande, the Secretary at the ELCZ Central Church Head Office in Bulawayo now, also serves as Bookshop Coordinator, which service was being done by a full-time salaried employee up to end of 2018. Under the new arrangement, the Bookshop service has apart from being available at the ELCZ Central Church Head Office, Bulawayo, moved to locations closer to ELCZ members in the dioceses. At these locations, some ELCZ units in the dioceses will be selling all the items (and more) that were distributed from the Bookshop which you knew. These items will be sold at one retail price nationwide, but the ELCZ distributor units which are still in process of setting up, will source their items through the Bookshop Coordinator at a lower price. The distributor units, as guided by the pastors in charge within their locality, will make their orders through the Bookshop Coordinator who in turn will organize the supplies ordered. The intention is to minimize stock holding which costs while ensuring availability of items at all times. Apart from supplying hardcopy materials, the Bookshop will also produce electronic hymnbooks accessible online on cellphones (and other similar gadgets) after payment of a small fee. These electronic hymnbooks are in the process of production and priority for production will be those electronic hymnbooks for which the ELCZ has authorship rights. Availability of these electronic hymnbooks should be a reality by mid-year 2019. The ELCZ Endowment Fund Trust Office in Bulawayo has a new Junior Accounting Officer in charge of the day to day affairs of the ELCZ Endowment Fund. She is Miss Siphiwe Ndlovu, who joined the office on 2 July 2018 when she replaced Miss Kalaba Mwachenya. We welcome Miss Ndlovu to the ELCZ Endowment Fund and wish her the best of God’s blessings. This is to inform that Mlungisi Mnikwa is no longer working at Njube Infohut where he was Infohut Facilitator. Any queries regarding Njube Infohut should be directed to the Health Services Coordinator on (029)2254991-2. The ELCZ Endowment Fund Trust Office in Bulawayo has a new Junior Accounting Officer in charge of the day to day affairs of the ELCZ Endowment Fund. She is Miss Kalaba Mwachenya, who joined the office on 6 February 2018 when she replaced Mr Kuda Chitsatse. We welcome Miss Mwachenya to the ELCZ Endowment Fund and wish her the best of God’s blessings. Ms Sikhathele Maseko, a member of ELCZ City Centre congregation, was appointed as warden of Njube Youth Centre, Bulawayo to replace the retired Ms Priscilla Hove. Ms Maseko is a widow, with two young daughters and she joined the employ of the Church on 1 March 2017 from Rainbow Tourism Group. We welcome Ms Maseko to Njube Youth Centre and wish her the best of God’s blessings on this new assignment while we also wish Ms Hove a well- deserved rest after 40 years’ service at Njube Youth Centre. 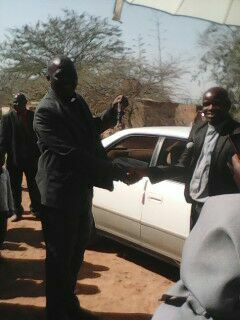 The ELCZ Western Deanery Dean, Kenneth Sibanda handed over car keys to Rev Onias Moyo at Mwanezi parish on Sunday 21 August 2016. 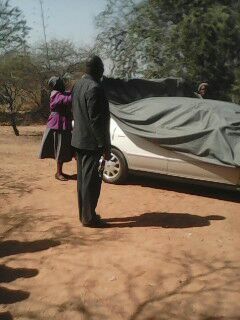 The parish bought a car for the pastor for parish use. The pastor was given the option to pay for the car on instalments so that he goes with the car when transferring to another parish. This gesture is a start in the Central Diocese where Mwanezi parish is located, and should go a long way to motivate this pastor to demonstrate the positive impact in his work. 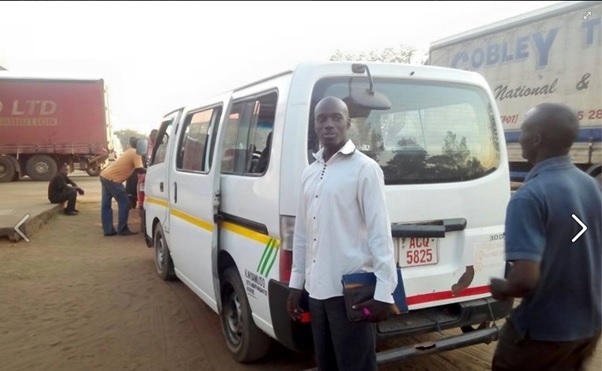 The Lord has been faithful to us those members at Evangelical Lutheran Church in Zimbabwe (ELCZ) Gokwe centre, as Gokwe Parish recently in August 2015, acquired an 18 seater Nissan Caravan seater minibus for the purpose of establishing an income generating project in line with the ELCZ national vision 'towards a self- sustainable church" This minibus plys the Chitekete- Gokwe- Kwekwe route. According to the Gokwe Pastor in Charge, Rev Rudorwashe Ronald Shumba, their vision as a parish is to buy another minibus of similar size before the year end 2015 and to buy a 65 seater bus by year end 2016. Although belated, the 2015 World Malaria day commemoration was “exceptionally planned and highly attended” according to the project coordinator Mrs Y.Muzezewa. The event which was conducted on Friday the 15th of May 2015 at Burure Clinic, saw approximately 3 000 people defying the scorching heat and witnessing and participating for close to five hours. In attendance were pupils from eight nearby schools, nurses from nearby clinics, community structures, environmental health technicians from across Gokwe North, the District Education Officer, the District Administrator’s office, the office of the President, government departments in the district, local NGOs, Gokwe North and Gokwe South district health executive committees, ELCZ malaria team, community leaders including Chief Simuchembo and Headman Madzivazvido and the general Burure community. The theme for the 2015 World malaria day was “Invest in the future. Defeat malaria”. Investing in the future is the business of all stakeholders hence the invitation of a cross section of the community. The day started with presentations from practically every school present. Each school health club had a message to disseminate on malaria prevention, control and treatment. Some however spiced the messages with other health and wellness messages as school health clubs concentrate on different health issues. Of note was Kabuyuni primary school which had a drama which summarised all the aspects of malaria control. Three ELCZ malaria ambassadors also took to the stage and Mr Muyashu, the ambassador from Gumunyu left the malaria team really proud of the concept of malaria ambassadors. He showed so much passion for his work that much can be accomplished through him. Reverend Mataka, the Burure Parish Pastor in Charge, delivered a speech on behalf of the Church. Reference was made to the gains the project has realised up to date and how it wishes community structures could continue the project even after 2015. This did not go down well with most community leaders who expressed that the Church still had a lot to do under the malaria project. On behalf of Chief Simuchembo, Mr Simuchembo pictured below begged the Church to continue especially with the component of Internal Lending and Saving Schemes (ISALs). He being a malaria ambassador as well highlighted that in his area he has realised that ISALs can raise the standard of living of the people thereby improving their health. The other people who made speeches in line with the theme of the day were representatives from the DA’s office, rural district council, Gokwe North District Medical Officer, Provincial Environmental Office and finally the guest of honour who was the DMO from Gokwe South. The guest of honour chronicled the journey the district has travelled in relation to malaria control but also gave warning that people should not relax as some areas in Gokwe North recorded outbreaks this year. He mentioned that the country is now working towards elimination and Gokwe North should not derail the process. Outbreaks and deaths were recorded mostly in Zhomba and Chireya areas. The day was concluded by what seemed to be like a ‘post- test’. The community sister from Nembudziya was requested to conduct quiz to assess the level of knowledge among the general community. The prizes were t/shirts from ELCZ malaria project with the message “Munhu muneti, mushonga kumadziro.Wafiritisa here?” From the responses that were given, it could be concluded that the project has done a good job on malaria awareness. If this knowledge could be put into action then we are truly on the road to defeating malaria and the future is indeed bright. 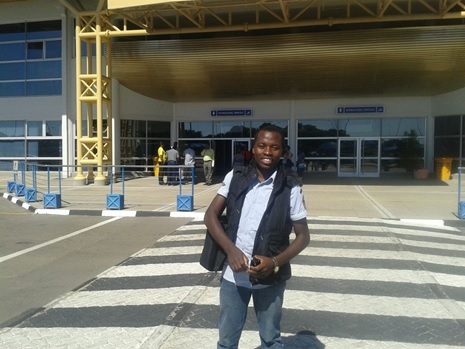 Winston Tshili, a youth from the ELCZ’s Western Diocese, left for Colorado, in the United States of America on 19 May 2015 under the Evangelical Lutheran Church in America (ELCA) International Camp Counselor Program. The ELCA International Camp Counselor Program is an annual program that runs at ELCA camps every summer (May to August) and ELCZ has been requested to select a nominee every year since 2006, but the hitch has been getting an entry visa. However, this year, Winston Tshili, the ELCZ nominee, was successful in getting the much elusive visa, making it the second time in a row when the ELCZ nominee successfully got an entry visa into the USA. While in the USA, Winston will represent the ELCZ, a partner church to the ELCA, to do ministry and return home in August 2015 with new ideas and a better understanding of the world as he will, while in the USA, meet young adults from the USA, Europe, Asia, Australia, Central and South America as well as Africa. Counselors, of which he will be part, will be expected to serve on camp staff for about 11 weeks where they will be asked to share gifts in Bible study, worship, recreation, music and any other skills specific to individuals. Winston may also be asked together with other staff, to do food service as well as routine maintenance work. We wish him the very best of God’s blessings as he works and lives in new territories facing new challenges for his benefit, that of the ELCZ, the church universal and humanity! 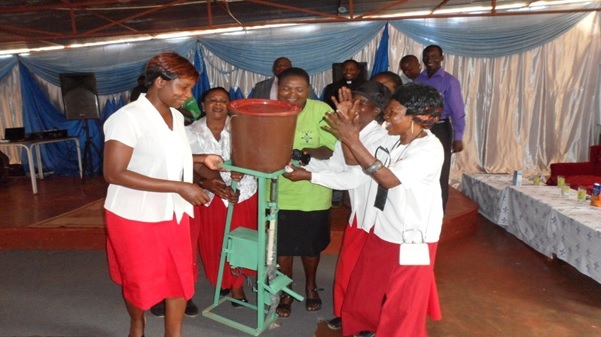 The Evangelical Lutheran Church in Zimbabwe (ELCZ) runs a project to enable the discussion of gender and imbalanced cultural practices by its membership countrywide. This project is run with the support of the Lutheran World Federation (LWF) / Department of Mission and Development (DMD). At the foundation of the project, lay the ambition to contribute to the realization of third Millennium Development Goal (MDG), by striving for the empowerment of women and promotion of gender equality both within the Church and society as a whole. In many traditional communities, gender is a sensitive issue that may go against established norms and practices. Marked by several workshops and awareness campaigns, 2014 was another year in which the ELCZ took concrete steps towards the eradication of gender stereotypes and prejudices, injustice in the provision of education, and fear of gender-based violence. In 2014, touched by the project’s awareness campaigns and open discussion experiences, a community in Chikombedzi was galvanized to initiate the building of a local secondary school, with the aim of promoting girls’ school attendance by cutting down the risks of violence against women posed by long distance walked by girls to attend school. Increased reporting of gender-based violence also reflected a growing awareness of changing attitudes slowly translating into the actions. A Chamaware community, in turn, had a capacity building workshop on community and church leadership become a starting point for an eye-opening discussion on the context of equal opportunities and definitions of gender. In 2014 also, an activity involving seventy women in Kwekwe was implemented to discuss women’s empowerment and leadership and encourage speaking out on hushed issues and injustices against women.. The government and other civil organisations have become aware of the ELCZ gender justice approach and activities and government appreciates the interventions in the process promising the project long term sustainability through accompaniment from government. With 2014 marking the end of Phase 1 of the ELCZ Gender Justice project with DMD/LWF, ELCZ is aiming to build on its achievements and incorporate into its agenda Sustainable Development Goals. Picture Above: One member of youth group contributing on the cultural practice that that makes a boy child more superior than a girl child in being given priority on education or on inheritance at the 2015 Rengwe Parish Easter Revival. From left, MP for Hwange West Hon Mpofu, Permanent secretary Mrs E Ndlovu, Officer from SMEs Mrs Chigwere and Reverend Maphosa from ELCZ following proceedings. The Evangelical Lutheran Church in Zimbabwe’s malaria project is cognisant of the fact that malaria is both a root cause and a consequence of poverty. As such the project is implementing a livelihoods component within its project. Under this component, the activities implemented include internal saving and lending schemes, income generating groups and self-help groups. Since June 2013, the project has managed to form 473 ISAL groups, with a total membership is 5 441. Of these, most of them are women. The amount saved per month ranges from 1 dollar to 50 dollars per person. As of end of September 2014, $118 302 was circulating as loans among the 473 groups. Saving cycle is between 6 months and 12 moths. The loans are being used to start household income generating projects. Most of these small household projects are into buying and selling. As a way of cushioning each other from the economic impact of malaria, HIV and AIDS and other diseases, ISALs have decided to have a social fund which will be loaned to a member at no interest in the case of illness or death. By the end of September, the social fund amounted to $3 063. Two of the ISALs have diversified to become self- help groups. These 2 groups continue with their usual monthly saving and lending but also saving an extra fund which is given to one member per month to procure household assets. Currently the members have purchased cattle, goats, kitchen utensils and bedroom ware. A lot of beautiful stories have been told from the ISAL groups. 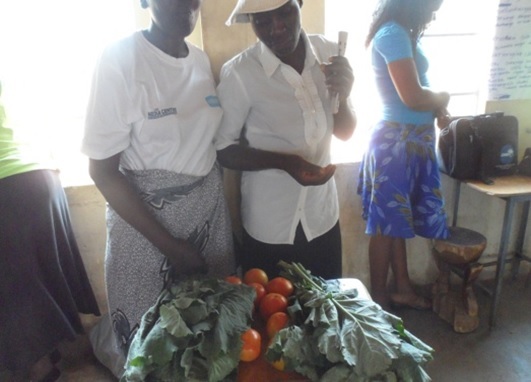 Some group members testify that their household nutrition has improved through the saving. Some households have managed to pay their children’s school fees without any hassles. Besides the improved household income, ISALs have brought general women empowerment. According to one lady, they are now able to enjoy their marriages without the marital conflicts caused by economic challenges. ISALs have become social groups for development, community social ills are identified through these groups and solutions are sought. 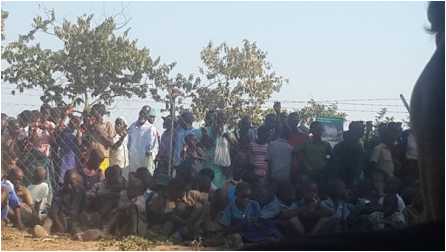 It is because of the great work that these ISALs has done that the malaria project conducted a field day in Hwange district to facilitate the sharing of experiences and also as a way of encouraging the general community to participate. 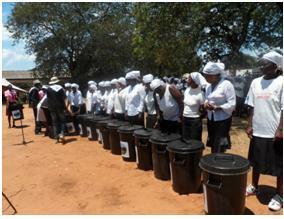 On the 3rd and the 4th of October 2014, 2 field days were conducted in Hwange and Victoria Falls areas respectively. The Permanent Secretary from Ministry of Small and Medium Enterprise and Cooperative Development, Mrs E. Ndlovu was the Guest of Honour, the Member of Parliament for Hwange West constituency, Honourable Bekithemba Mpofu and Dean Vhudzijena of ELCZ were among the dignitaries gracing the functions. At both Mashake Secondary School in Chikandakubi ward and Victoria Falls, ISALs had the opportunity to exhibit what they have managed to do as groups. Some had household materials, some livestock and some garden produce. In her speech, the Guest of Honour encouraged group members to utilise their God-given resources to their advantage. She spoke about how some ladies opened a restaurant which only sells traditional foods. She also elaborated that they should not only focus on saving for consumption and for household goods but should look at big projects that will generate money. Her ministry was said to be registering saving and lending schemes as cooperatives which can access loans from different institutions. She said that currently they have a fund which they give $10 000 to schemes that are registered and are performing well. She applauded ELCZ for initiating such a project. The Dean from ELCZ explained that Lutheran rejoices when it has managed to facilitate in the provision of life in fullness (John 10.10). This life in fullness means life free from extreme poverty, malaria, HIV and AIDS and other social ills. He encouraged ISAL members to continue on fighting for the good cause. Ministry of Small and Medium Enterprise and Cooperative Development together with ELCZ selected the best 3 ISALs from each area. The first prize for the rural group was a peanut butter making machine and for the urban it was a freezit making machine. Other prizes included goats and poultry feed. It is with a sad heart that I have to inform you about the passing away of Rhodes Ndlovu, the Dean of the Northern Deanery of the ELCZ’s Western Diocese, on the 15th of June 2014 around 8pm. He suffered an asthma attack and passed on at an emergency clinic close to his home in Bulawayo. He is said to have just arrived from a visit to one of the rural parishes under his deanery when the attack occurred. I wish to advise that the planned arrangements for the burial of the late Dean R Ndlovu are that the funeral service will be held at Njube Youth Centre, Bulawayo at 8.00am on 19 June 2014 after which burial will take place at West Park Cemetery in Bulawayo on that day. Mourners are requested to be seated at the funeral service at 7.45am. Currently mourners are gathered at house number 3102 Nketa 7, Bulawayo. The consecration for Bishop Elect of the ELCZ Eastern Diocese, Rev Chemist Faindi will be held on 5 January 2014 at ELCZ Highfields Chapel, 4969 Mangwende Drive, Highfield in Harare. This date replaces the original date of 15 December 2013 that had been communicated earlier on. Several dignitaries from within and outside Zimbabwe, including some from partner churches, have been invited to attend the event which will start at 8.30am on the day. pastorate. Speaking at the ordination, the ELCZ Presiding Bishop, the Right Rev Dr S M Dube challenged the ordained pastors to lead a life of service on this lifelong journey as a pastor, emulating the life of our Lord Jesus Christ. He thanked the organizers under Rev Janasi for the wonderful hosting which had started with the pre-ordination retreat ending with the ordination. Qualifications : An appropriate degree or equivalent qualifications related to health and community development. 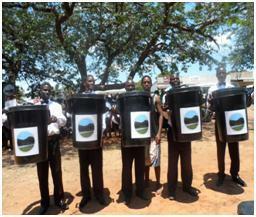 involved in malaria control activities.Link the project with formal health systems. Experience:A minimum of 3 years field experience in planning and implementing community based programmes. Skills :Understanding of and commitment to church-based work. A strong understanding of community-based malaria programming, community-based health care. Able to speak local languages i.e. Ndebele and Tonga/Nambya for Hwange and Shona for Gokwe. Good computer skills and knowledge of Microsoft Office® software, internet and email programmes. We wish to inform you that following elections held by the Church Assembly on Saturday, 26 October 2013 to fill the post of Bishop John S Moyo of the Evangelical Lutheran Church in Zimbabwe (ELCZ)’s Eastern Diocese who retires at the end of 2013, Rev Chemist Faindi won the vote to become ELCZ Eastern Diocese Bishop. He (Rev Faindi) won the vote against Rev Mable Sipike Dube in a contest that pitted a male pastor against a female pastor. The consecration of the Bishop elect of the Eastern Diocese will be held on 15 December 2013 in the Eastern Diocese at a venue to be finalised. The day was Tuesday, 10 September 2013 when ELCZ Njube Youth Centre, represented by Ms P Hove, the Centre Director, donated blankets, sheets and pillows to Manama Hospital. The handover ceremony, graced by the Bishop of the Western Diocese, the Right Rev Dr S M Dube, was attended by Rev Bertil Murray and Katarina Olofsgard from Church of Sweden’s Uppsala Diocese, who happened to be visiting Manama Mission at the time with the General Secretary, Munatsi Munyaradzi Dube. Speaking at the handover ceremony, Bishop Dube thanked the Njube Youth Centre team for thinking of the needy institutions in the ELCZ stable- the hospitals. He emphasized the need for individuals and units within the Church to think of ways to alleviate pain and suffering of the needy among us like the patients. He went on to say that the gesture from Njube Youth Centre is worth emulating as “..it is more blessed to give than receive” In conclusion, he stated that the gesture from Njube Youth Centre was ample proof that it is possible for all of us to give a hand to our own. 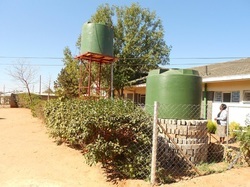 ELCZ Njube Youth Centre has just installed their fourth water storage tank to beat the water blues that have hit the city of Bulawayo following another poor rainy season. Speaking to the ELCZ General Secretary M M Dube during a tour of the water storage facilities on 14 June 2013, the Director of the Centre, Ms P Hove said that the new tank improved the capacity of the centre to do business as without additional water, guests cannot be attracted to book in for their activities. Ms Hove said she owed this development to God and sees His Amazing Grace ever since the centre was repaired after being partially gutted down by fire on 22 July 2007. The new tank has a capacity of 5,000 litres and is placed on a 4 metre stand to allow water to gravitate to various parts of the centre. 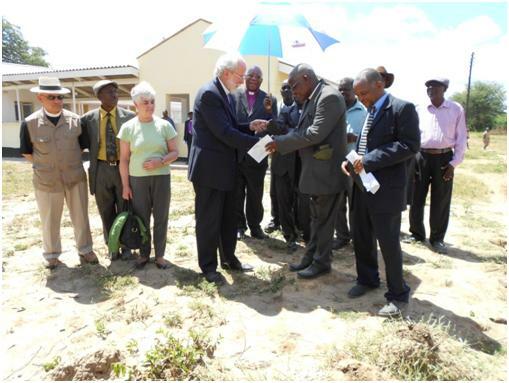 _ The Presiding Bishop of the Evangelical Lutheran Church in America (ELCA), Rev Dr Mark Hanson visited Zimbabwe as guest of the Evangelical Lutheran Church in Zimbabwe (ELCZ) from 19 March to 23 March 2013. On arrival at Bulawayo’s Joshua Mqabuko Nkomo International Airport, Bishop Hanson who was accompanied by his wife Iona, Rev Dr Raphael Malpica Padilla (Director ELCA Global Mission Unit) and Rev Benyam Kassahun (Program Director for East and Southern Africa in the ELCA Global Mission Unit) was met by the ELCZ Presiding Bishop, the Right Rev Dr Stephen Dube and the ELCZ Eastern Diocese Bishop, the Right Rev John S Moyo as well as ELCZ General Secretary, Munatsi M Dube and Bishop Emeritus Dr Ambrose Moyo. _ Bishop Mark Hanson (centre) listens as Huitsmang Dube, the City Centre Development Chairperson makes a presentation at the site of City Centre chapel under construction. The same day, 19 March 2013, the ELCA guests had the opportunity to visit the site where the City Centre congregation is constructing a chapel to solve a problem the city congregation have with statistical growth (congregation has 600 members) which has made it not only difficult, but expensive to rent space for church services every Sunday. The piece of land where the chapel is being constructed was acquired through financial assistance of the ELCA. 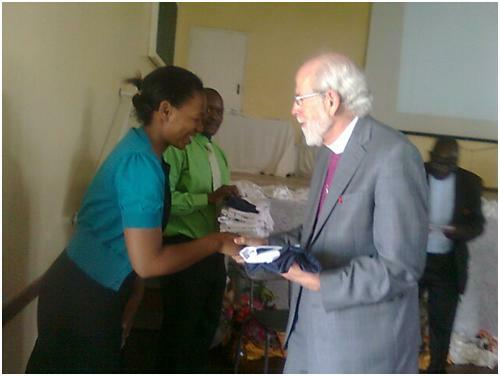 _ On the following day, 20 March 2013, Bishop Mark Hanson and delegation attended a graduation of Njube Infohut students who had gone through a Life Skills and Information and Technology course at the Njube Infohut Centre. The guests were treated to testimonies and presentations by students about how much positive impact the course had in their lives. Some students are now at universities where their background training at Infohut was assisting them resist the temptations that come with the freedoms of university education. The climax of the visit to Infohut was when one of the graduands, Mrs Shava, parent of a former Infohut student, testified that Infohut had molded her once rebellious son into a fine young man who was now at university and the impact on the son had been so positive that she and her husband had decided to go through the Infohut course and hence she was graduating on the day. _ While still at Njube Youth Centre, Bishop Mark Hanson’s delegation took the opportunity to meet the Board members of the Ecumenical Church Leaders’ Forum whose Executive Director is Bishop Emeritus Dr Ambrose Moyo and Chairperson of the Board of Trustees is Bishop Danisa Ndlovu of the Brethren in Christ Church. The Ecumenical Church Leaders Forum (hereafter called ECLF) is a grouping of Christian Leaders from Zimbabwe’s church umbrella bodies whose vision is to transform and empower the people of Zimbabwe, into a God-fearing, peaceful and just society. The ECLF views itself as the conscience, hands and feet of the Church towards helping the nation to realize the fulfillment of Jesus’ declaration: “ I came so that you may have life and have it abundantly ” (John 10 vs 10). The last two sentences in this paragraph are from the ECLF website www.eclfz.org. 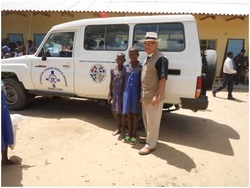 Later, on 21 March 2013, Bishop Hanson and delegation together with their hosts, travelled to Burure where the ELCZ have set up a new mission station that has a primary school and secondary school as well as a newly constructed clinic which is yet to open. 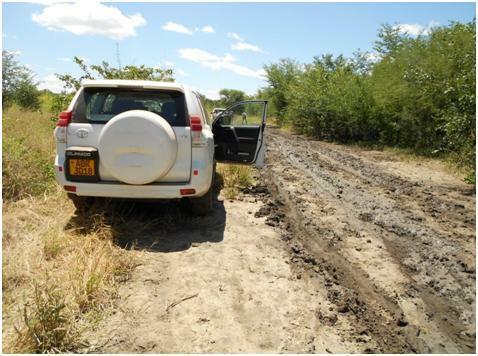 However, the group only got to Burure after being stuck a few times in the mud on the notorious 7 kilometre stretch to Burure whose condition had been worsened by rains that fell late on 20 March 2013. _ The travelling party wound up their day when they visited an ELCZ malaria project site at Madzivazvido congregation where they crossed paths with another ELCA delegation that was on a monitoring visit to the malaria project. They engaged the ELCZ community there that is involved in a home based grocery shop whose proceeds are to be used for combating malaria through purchase of mosquito nets for vulnerable groups (children under 5years, the elderly and HIV and AIDS victims). The crowning of Bishop Hanson’s visit was when on 22 March 2013 he officially opened the classroom block at Burure Secondary School and the Burure Infohut as well as hand over an ambulance to the ELCZ for use by Burure Clinic. _ Burure Clinic was at the same occasion handed over to the ELCZ by Bishop Hanson with the request that the ELCZ and community expedite the operationalisation of the clinic to curtail suffering by the community since the clinic was complete and only awaited the various permits and clearances to start operation. 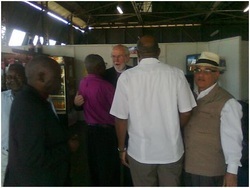 Bishop Hanson and delegation then concluded their visit by hosting a dinner for their guests at a restaurant in Bulawayo on 22 March 2013 after which there was a meeting with the ELCZ leadership to review the visit and chart the way forward in the relationship between the two parties. On 23 March 2013, it was time to bid farewell when Bishop Hanson, his delegation as well as the ELCA malaria project monitoring team left for Johannesburg where they would link up with other ELCA malaria projects’ monitoring teams (that had gone to Zambia and Malawi) to evaluate the entire trip before proceeding home to the United States of America. One thing that will surely be embedded in the minds of Bishop Hanson and his delegation is the never say die of the Zimbabwean people- a myriad of problems does not dampen their spirits and the experiences at Burure where fresh water is a rare commodity, malaria is endemic, roads are almost impassable and the heat is unbearable bore testimony to this. _Infohut Njube will be having graduation ceremony for the two Infohut 2012 Intakes, on the 22 of March 2013 at Njube Youth Center from 0800hrs to 1200hrs. All are invited. Come celebrate with us on this joyous occasion. Lots of entertainment and re-freshment for all. As part of the Waste Management Committee in the Resort Town, twelve Community Health Workers under the ELCZ Malaria Project mobilised the community to clean the whole of Victoria Falls. They slashed tall grasses and cleared the area of all rubbish. The clean up was done on the 28th of February. The project procured cleaning equipment which was used during the campaign.The equipment ranged from slashers, rubbish bins,shovels and many others.The equipment remains the project’s property and is to be used everytime there is a cleanup campaign. For 2013, the agreement is that as the nation prepares for UNWTO conference, the cleanups should be done after every 2 months. As the tourism department is smiling on the anticipation that cleaner cities will bring about improved flows of tourists, the ELCZ Malaria Project is smiling on the knowledge that cleaner cities brings about reduced mosquito breeding and therefore reduced malaria cases. 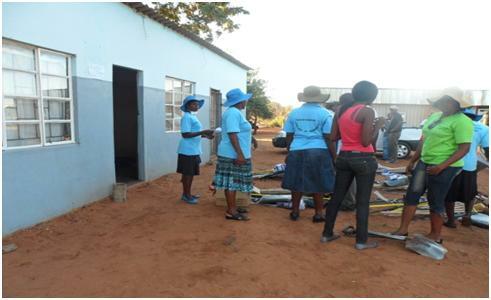 Besides mobilising and supervising the cleanup, the Community Health Workers mobilised the community to come up with messages on the importance of clean environments for disease prevention. The messages were then presented in form of drama and songs. All the three groups that took part impressed the Minister of Environment, Comrade F.Nhema so much that he gave all of them refuse bins. _A group of 30 members of the Northern Deanery of the Evangelical Lutheran Church in Zimbabwe (ELCZ) Western Diocese travelled some 400 km from Bulawayo to Victoria Falls to conduct an outreach of sowing the seed of God’s salvation. The outreach was in the main held with the assistance of Lutheran Hour Ministries where the Bulawayo based team members paid for the food and part of transport cost. The trip started in the morning of 15 February 2013 and ended with arrival at Monde Primary School in Victoria Falls at 16.30 hrs where a tent was pitched for the outreach activities of salvation and hope. The programme started with an opening service conducted on that same day by the local student pastor Maphosa who is responsible for Victoria Falls parish. In the evening an evangelistic session was conducted where there was an attendance over 140 people. At that session, six people indicated that they wanted to give their lives to Jesus Christ. Four of them were prayed for and demons manifested in them and were cast out. 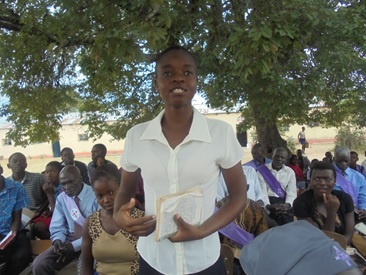 On the 16 February 2013 six groups were formed and sent out into homes to preach the Word of salvation. The send off devotions to these groups were conducted by Dean Vudzijena. In this session, 99 homes were visited and 260 people were preached to. A total of 36 children were spoken to as well during the preaching in homes. The groups reported a warm welcome in all the homes they visited; a sign that people are hungry and thirsty for the Word of God. The evening session started with a communion service conducted by Dean R. Ndlovu. After the service, Mr Tanaka Chihora conducted an evangelistic session which was attended by over 300 people. Over thirty people came forward to be prayed for various needs. One man confessed that he had made up his mind to kill himself but the Word preached destroyed the idea. He expressed hope for a better future with Christ who came into his life. We praise the Lord for a thrilling and successful outreach. The seed was sown and the Lord will make it geminate and grow. May His name be praised! The majority of the long awaited computers for Manama High and Burure Primary and Secondary Schools were delivered at the ELCZ Head Office in Bulawayo by the suppliers on Tuesday, 26 February 2013, bringing to an end what had been a long and at times worrying wait. This latest delivery had 27 computers to augment to the 10 computers that had been received earlier bringing the total computers received to 37, leaving a balance of 3 computers. The receipt of the computers should see the prompt set up of Infohut at the two sites to bring much needed HIV and AIDS awareness and Life Skills to the two schools. 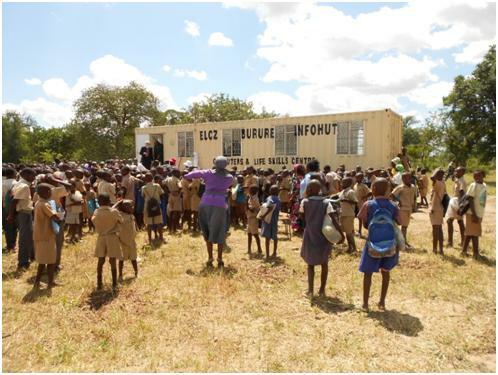 For Burure Secondary School, the setup of Infohut will end a long wait whose last action was when the haulage truck ferrying the 40 foot container Infohut classroom was stuck for at the dry Burure River crossing in November 2012. Heads of various units in the ELCZ met at the ELCZ’s Vashandiri Centre, Gweru, from 27 to 28 August 2012 in a Strategic Planning Workshop for the cycle that ends in 2015. Presiding Bishop Dr Stephen Dube, Bishop Naison Shava and Bishop John S Moyo led their Deans and other workers from the Central Church Head Office, schools and hospitals to conclude the planning for the cycle. Opening the workshop, the Presiding Bishop Dube emphasised the need for the plans to be translated into action so that there is better efficiency and effectiveness especially in light of the ever diminishing resources worsened by the global economic crisis and recurrent droughts in the region. The Church has not been spared from the negative impact of the crises, he said. He bemoaned the plethora of problems in the country and various institutions such as the church, problems which would be reduced by better planning, implementation and re- planning in a continuous process. The workshop drew in senior pastors, medical doctors, administrators and project workers- all who participated enthusiastically sharing their experiences and plans. A lot of emphasis was placed on clearly articulating objectives, actions, resources, indicators, results, strategies and evaluation. The Strategic Plan would be cascaded to all units in the ELCZ and it was agreed that from thereon, it was not going to be business as usual, but all systems go in line with the Strategic Plan so as to make the Church more relevant to its stakeholders in an ever changing environment.